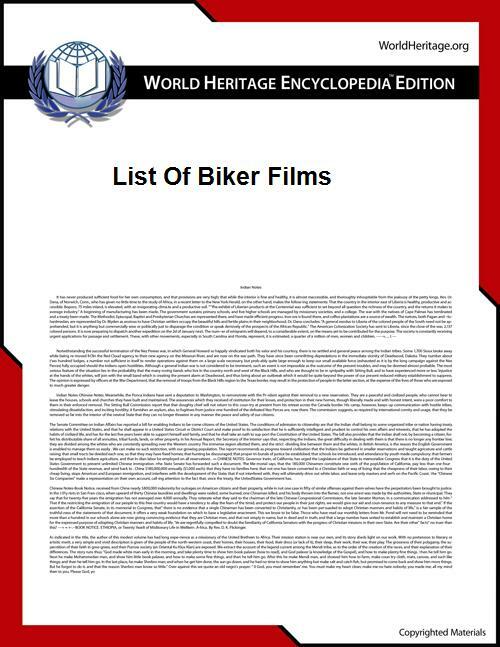 This list is for films where at least one biker appears as a significant plot element. A bike in a film does not qualify for this list. Harvey Lembeck also did a parody of Marlon Brando from The Wild One as the bumbling leader of the inept Rat Pack motorcycle gang in six Beach Party films: Beach Party (1963), Bikini Beach and Pajama Party (both 1964), Beach Blanket Bingo and How to Stuff a Wild Bikini (both 1965), and The Ghost in the Invisible Bikini (1966). This film-related list is ; you can help by . Russ Meyer, Motorpsycho, Mudhoney, 1965 In Film, Faster, Pussycat! Kill! Kill!